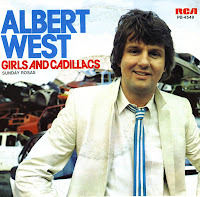 Released in 1980, I always interpreted Albert West's song 'Girls and Cadillacs' as the story of a fallen popstar. 'Goodbye to girls and Cadillacs / I had my share and I had a ball'. The sleeve was rather appropriate with all the carwrecks, but I did wonder where the girls were in that picture. 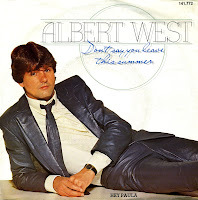 The single was Albert West's first hit since 'Listen' (1977), peaking at number 23 in the Dutch Top 40. Albert Westelaken was born on September 2, 1949 in Den Bosch, Netherlands. In the early Seventies he was lead singer of the Shuffles, until he left the band in 1973 to pursue a solo career. His third solo single, 'Ginny come lately', a cover of a song by Brian Hyland, became a big hit not only in the Netherlands but in all of Europe. It gave his career the boost it needed to become as successful as it would stay throughout the Seventies. 'Don't say you leave this summer' was recorded and released in 1981. It was taken from his album 'A piece of me', which was produced by Martin Duiser. The female vocals were provided by another wellknown Dutch singer: Anita Meyer. The single reached number 26 in the Dutch Top 40.